Boundary-Pushing Late Night Hosts Move On — Colbert Up, Ferguson Out Both Stephen Colbert and Craig Ferguson end their late-night TV shows this week. Colbert is getting a boatload of attention as he moves to succeed David Letterman, but Ferguson deserves some too. 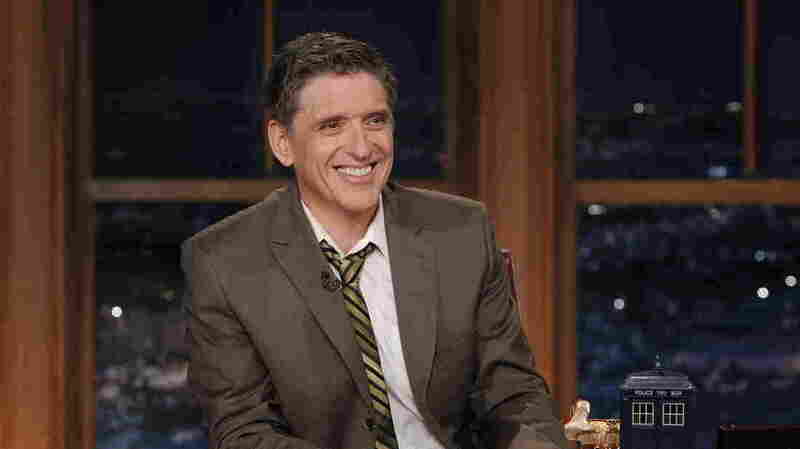 Craig Ferguson hosts The Late Late Show in 2011. They both started their late-night shows in the same year, reinventing their respective corners of television by bending and sometimes breaking the rules. But as Stephen Colbert and Craig Ferguson both say goodbye to long-running programs this week, only one has turned his showbiz rebellion into a launchpad for an even bigger TV platform. From the cover of Entertainment Weekly to shoutouts from James Franco and Michael J. Fox, everyone seems to be talking about tonight's finale of The Colbert Report. Including, to no one's surprise, the host himself. But there's another long-running late-night host also saying goodbye this week. On Friday, Craig Ferguson hosts his last episode of CBS' The Late Late Show after nearly 10 years. His departure isn't getting much attention — in part because he's leaving as CBS builds its new late-night franchise around Colbert, who will replace retiring legend David Letterman in the new year. Both Colbert and Ferguson blew up the traditional talk show format, but each man accomplished it in his own, unique way. Ferguson built a show that often played like an impish inside joke, poking fun at the ubiquitous talk show sidekick by having a robot skeleton sidekick built and naming it Geoff Peterson. Because he was voiced by ace impressionist and comedian Josh Robert Thompson, Geoff turned out to be a pretty good sidekick after all, especially when he did a mean Morgan Freeman impersonation, right in front of Morgan Freeman. Colbert started his show after eight years on The Daily Show. On the Report, he played an egotistical, defiantly ignorant conservative pundit. At times, he took that character into the real world, creating a superPAC, insulting President George W. Bush at the White House Correspondents' Dinner and testifying before Congress about undocumented immigrants working on U.S. farms. Later, Colbert told David Gregory on NBC's Meet the Press that such stunts help make tough political points in a less confrontational way. Craig Ferguson took over The Late Late Show in 2005, the same year The Colbert Report began. He was chosen from several guest hosts who tried out for the job after the departure of previous host Craig Kilborn. He had no house band, tore up his note cards with suggested questions before every celebrity interview and improvised his monologues — including a serious vow to tone down making fun of celebrities in crisis when Britney Spears had a meltdown on the anniversary of his own sobriety. His instincts could lead to great television, including a long-running bit centered on his successful effort to become a U.S. citizen and a heartfelt talk with Bishop Desmond Tutu. But Ferguson also created a show filled with jokes built on past jokes, making it tough to cultivate new fans or compete in the ratings with rivals Jimmy Fallon and Seth Meyers. Ferguson has said he had already planned to leave the network before Letterman announced his retirement; British comedian James Corden takes over the Late Late Show in March. One birthed a future star of the genre and another ended as a noble experiment which never quite lived up to its potential.